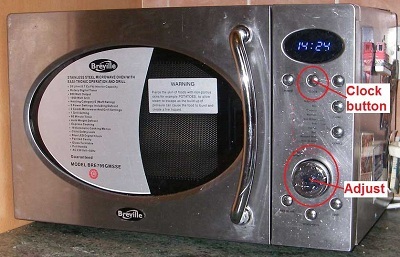 Adjust time clock or set time on Breville microwave oven. How to adjust the time clock or set the time on a Breville microwave oven. Rotate Timer/Menu knob to adjust the hours (0 - 23, 24 hour day). Rotate Timer/Menu knob to adjust the minutes (0 - 60). If you wish, you may comment on this page by emailing me at eric@satsig.net.